Today’s choice is either a neglected classic begging for revival or a hopelessly stodgy moniker best left in the past. Thanks to Cat for suggesting our Name of the Day: Frederick. Frederick has a regal sound, and indeed his meaning matches up. The Germanic elements frid – peace – and ric – ruler – combined into Fridurih and eventually Friedrich. 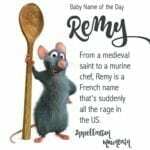 It caught on among the Germans, Austrians and Scandinavians and you can find plenty of kings and aristocrats wearing the name. Frederick the Great – King Frederick II of Prussia – is remembered as an enlightened despot; one of those 18th century rulers influenced by Voltaire and determined to modernize his lands. During his rule, he transformed Prussia both economically and administratively, and practiced a policy of religious tolerance. 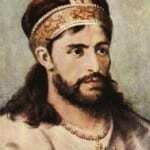 He’s not without controversy – but then few kings are. You’ll find far fewer Fredericks in English history. In French he’s Frédéric, and the Normans brought him along on their invasion, but he was used sparingly. Long running television character Frasier Crane chose the name for his son. In the US, Frederick was firmly rooted in the Top 50 through 1893, and stayed in the Top 100 until 1957. Doubtless we’ve overlooked many a notable Fred. But something interesting happened to this name in the 20th century. While other late 19th century staples like Charles and Samuel are back in a big way, Frederick has failed to experience a revival. In fact, he’s fallen steadily since 1957 and stands at a nearly obscure #531 today. In this case, we must say that we’re on the side of the FRED Society. 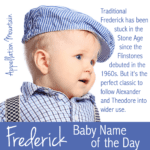 Frederick is a classic, and certainly fits with choices like Alexander and Theodore. Freddie is a darling nickname for a child, and Fred is perfectly reasonable for a grown man. Should Fred feel too brief, however, the full name is easily used instead. We also can’t help note that popular choices like Derek and Eric are buried in this name – and could easily be used as nicknames, too. Alternately, if you’re looking to honor a Derek or an Eric, you might still use Frederick as an elaboration. It’s our opinion that Frederick is long overdue for a comeback. Trent from Daria is “Trent” to me. Which is a good thing, he’s definitely my biggest animated crush of all time. So because of that Trent will always be a little cool, to me. But on the other hand, it really does sound dated. I can’t imagine meeting a very little Trent any time soon, unless his parents were really punk rock and dressed him accordingly. As for Trenton, being from California (where nobody ever thinks about New Jersey), I don’t really have the negative associations… even though I live in Pennsylvania now. I can see it being appealing to people who have never been there. Not something I’d ever consider, but I don’t think it’s far off from J/C/K/Br/Aiden. I knew a Trent in college a couple years ago. He wore it well. It’s nice enough, but I think it sounds a little short or clipped, more so than Lance and a lot of other one-syllable names. As for Wayne, I know a baby born a few months ago with Wayne as a middle name since it’s his father’s first name. It’ll be interesting to see when/if Wayne comes back. Photoqulity, I’m sure you’re right that Daria’s Trent was a reference to Reznor. I’ll admit that Trenton makes me think of New Jersey, too – so I can’t quite imagine parents choosing it for a child. But hey, plenty of mothers seem to find Braxton a reasonable choice for a son … the world is a strange place, indeed. I know. I grew up just south of the nasty NJ one. Like I said, other Trenton’s are likely to be nicer. (Maybe?). 🙂 I hope so, Allison, My Dad hated his name (his brothers got classics: James, Theodore & Richard) I’d love to see it get a bit more popular again, He’s a logical step in the “Tyler, Taylor, Carter” progression, too! Lola: My dad & brother are Waynes, too! Wayne will have his day in the sun again. We live about 5 miles away from Trenton, Fl. Think “My Name is Earl”, without any of the comedic value. Cool sounding name, unfortunate association. Trent’s okay. He’s not something I’d ever consider but I don’t mind his crisp sound. I too, always figured that Daria’s Trent was named for Reznor. Trent Lott makes my skin crawl, though and if I think too much more about that aspect of Trent, my brain may explode. I really don’t mind Trent, though. He sounds nice, has a decent background and is easy on the eyes. But me? I’m waiting for the tides to shift so Wayne becomes hip again. It was my Pop’s name and I have a soft spot for greying Wayne. (Funny how Trent & Wayne are in the same groove in my head). Trent gets a solid but unenthusiastic :thumbsup: from me. I can live with Trent. I’ve never met one and if it was only in the 200s that’s not all that popular. Somehow does not sound as dated as Lance to me (maybe Lance was more popular than Trent at one time). I haven’t been to Trenton and maybe it’s a great place but not too inspiring as a name. Not that I would ever use Trent, but seriously – it’s way more preferable than Trenton. I mean, have you been there? Why would you name your child Trenton? That’s worse than naming a girl Brooklyn. And totally annoying. I always thought the Trent on Daria was named after Reznor. Anyway, I’m a fan of Trent, but not in a way that would necessitate my naming a child Trent. I would not roll my eyes at this one – I think I would be shocked to meet a Trent more than any other emotion. I’ve never met one.